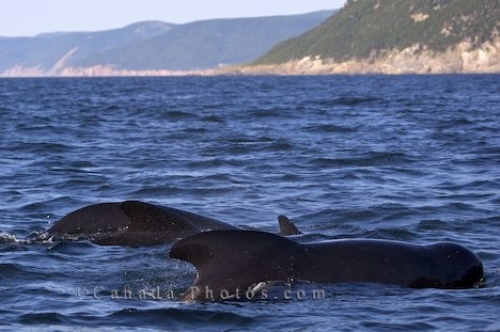 The dorsal fins of the Long Finned Pilot Whales are easily seen above the surface of the waters in the Gulf of St. Lawrence in Nova Scotia, Canada. The whale in the foreground gives us a good look at his round forehead before dipping below the cold waters of Nova Scotia. Picture of a pod of Long Finned Pilot Whales surfacing in the waters off Cape Breton in Nova Scotia, Canada.